I've been exploring greener period products for a few years and some options have been great and others have left me disappointed. It's a very personal journey with lots of opinions and I'd like to offer a space free from judgement. I haven't abandoned my menstrual cup completely however it isn't a perfect solution for me so I am still trialling organic pads as I like to use them in conjunction to the cup. 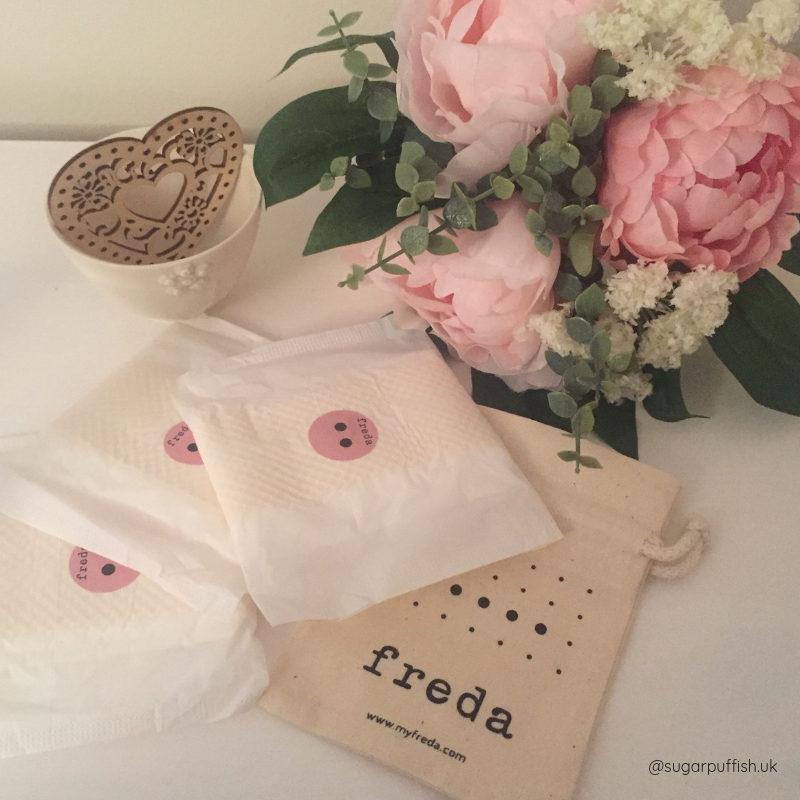 If you are looking to reduce your impact on the environment each month then let me introduce you to Freda a natural and organic period care subscription service. Freda has great eco credentials, products are made in Sweden using renewable energy and sending zero waste to landfill. Their tampons are made from organic cotton and they are currently in the process of switching over to plant based plastic for the applicators. I think it's important to provide options, not everyone is comfortable with non-applicator tampons and I personally find the cardboard version tricky to use. Freda also have pads made from 70% renewable material, whilst they do include a plastic backing this is also made from renewable material (50%). Freda kindly sent a box of their Super Day Pads. Each pad is wrapped individually in bio-film with an absorbent core made from chlorine-free, renewable and sustainable wood pulp. In comparison to other brands (both organic and high street) I found the Super pad thicker in size. It wasn't an issue for me and doesn't affect my experience but I feel worth noting. If you are switching from brands such as Always or Bodyform it might initially take a bit of getting used to. The adhesive was secure and to my liking, worth noting because it's been problematic for me with other brands. I've experience slippage and bunching which can be disastrous as I experience a heavy flow. I'd prefer a little more length to the Freda pad but was satisfied with absorbency and overall comfort. If you'd like to support companies which give back to the community you will love that Freda have a social mission. They support initiatives raising awareness for period poverty. At this time they are partnered with Bloody Good Period, The Red Box Project and A Bloody Good Cause. They also allow customers to donate pads/tampons to the initiative of their choice, you can find more information on this when visiting their website. As previously mentioned Freda offer a subscription service so you can have products delivered monthly to your letterbox. You have the choice of pre-selected boxes or create your own mix of products. A box contains 16 products and you can add more as a one off when required. You decide how often you need a delivery plus Freda have a helpful Period Calculator if you want to sync deliveries with your cycle.